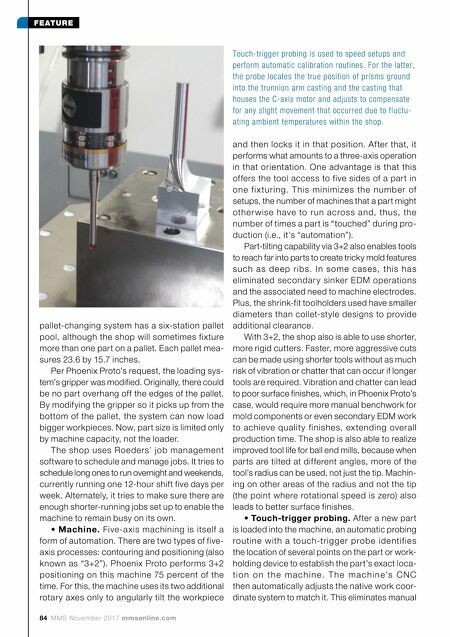 84 MMS November 2017 mmsonline.com FEATURE pallet-changing system has a six-station pallet pool, although the shop will sometimes fixture more than one part on a pallet. Each pallet mea- sures 23.6 by 15.7 inches. Per Phoenix Proto's request, the loading sys- tem's gripper was modified. Originally, there could be no part overhang off the edges of the pallet. By modifying the gripper so it picks up from the bottom of the pallet, the system can now load bigger workpieces. Now, part size is limited only by machine capacity, not the loader. The shop uses Roeders' job management software to schedule and manage jobs. It tries to schedule long ones to run overnight and weekends, currently running one 12-hour shift five days per week. Alternately, it tries to make sure there are enough shorter-running jobs set up to enable the machine to remain busy on its own. • Machine. Five-a xis machining is itself a form of automation. There are two types of five- axis processes: contouring and positioning (also known as "3+2"). Phoenix Proto performs 3+2 positioning on this machine 75 percent of the time. For this, the machine uses its two additional rotary axes only to angularly tilt the workpiece and then locks it in that position. Af ter that, it performs what amounts to a three-axis operation in that orientation. One advantage is that this offers the tool access to five sides of a part in one f ix tur ing. T his minimize s the numbe r of setups, the number of machines that a part might other wise have to run across and, thus, the number of times a part is "touched" during pro- duction (i.e., it's "automation"). Part-tilting capability via 3+2 also enables tools to reach far into parts to create tricky mold features su c h a s d e e p r ibs. In so m e c a se s, this h a s eliminated secondar y sinker EDM operations and the associated need to machine electrodes. Plus, the shrink-fit toolholders used have smaller diameters than collet-style designs to provide additional clearance. With 3+2, the shop also is able to use shorter, more rigid cutters. Faster, more aggressive cuts can be made using shorter tools without as much risk of vibration or chatter that can occur if longer tools are required. Vibration and chatter can lead to poor surface finishes, which, in Phoenix Proto's case, would require more manual benchwork for mold components or even secondary EDM work to achieve qualit y finishes, ex tending overall production time. The shop is also able to realize improved tool life for ball end mills, because when parts are tilted at different angles, more of the tool's radius can be used, not just the tip. Machin- ing on other areas of the radius and not the tip (the point where rotational speed is zero) also leads to better surface finishes. • Touch-trigger probing. After a new part is loaded into the machine, an automatic probing routine with a touch-trigger probe identif ies the location of several points on the part or work- holding device to establish the part's exact loca- t i o n o n t h e m a c h i n e . T h e m a c h i n e's C N C then automatically adjusts the native work coor- dinate system to match it. 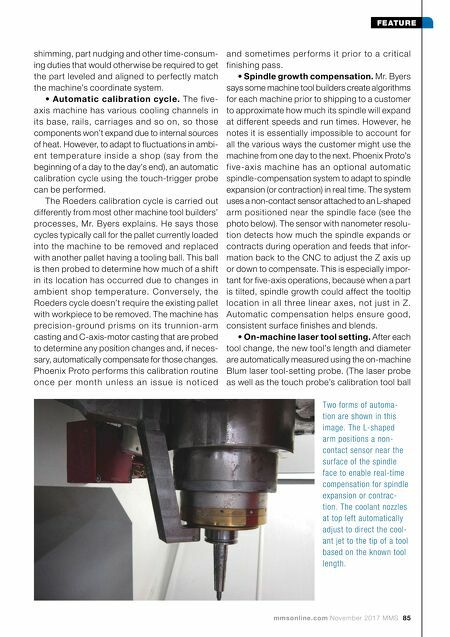 This eliminates manual Touch-trigger probing is used to speed setups and perform automatic calibration routines. For the latter, the probe locates the true position of prisms ground into the trunnion arm casting and the casting that houses the C-axis motor and adjusts to compensate for any slight movement that occurred due to fluctu- ating ambient temperatures within the shop.